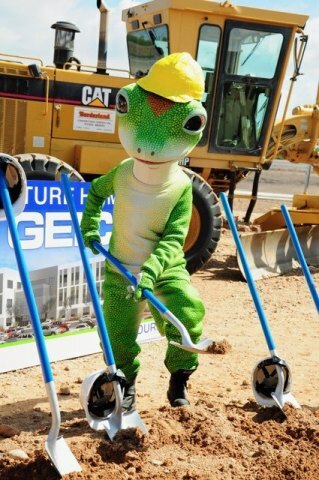 TUCSON, Ariz.--(BUSINESS WIRE)--GEICO broke ground at its new location in The Bridges and laid out plans for future hiring when the complex is completed next year. 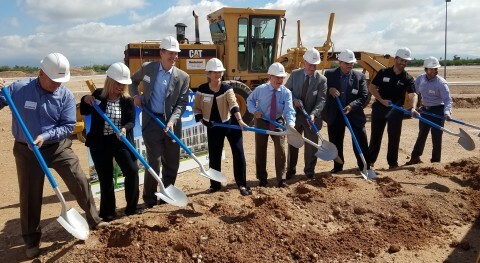 GEICO President and CEO Bill Roberts and Regional Vice President Michelle Trindade were joined by Tucson Mayor Jonathan Rothschild, Vice Mayor Richard Fimbres, Bourn Companies CEO Don Bourn, representatives from Tucson City Council, Pima County and local business and community leaders at the event. GEICO plans to hire 700 new associates over the next several years after its expected move-in date of late 2019. Tucson is now home to more than 1,500 GEICO associates who manage insurance operations for 1.4 million customers in seven western states including: Arizona, Nevada, Utah, Oregon, Washington, Idaho and Montana. Bourn Companies will handle all construction related to the new site, which consists of a 200,000 square-foot, three-story building that will occupy 20 acres of land. Amenities for GEICO associates at the new site will include modern open workspaces, an onsite cafeteria, fitness center, credit union and 20,000-square-feet of patios and outdoor space for associates to use during breaks. Additional project partners include Sun Corridor, Inc., Renaissance Companies, the Arizona Commerce Authority, Pima County and the City of Tucson. GEICO (Government Employees Insurance Company) is a member of the Berkshire Hathaway family of companies and is the second-largest private passenger auto insurance company in the United States. GEICO, which was founded in 1936, provides millions of car insurance quotes to U.S. drivers annually. The company is pleased to serve more than 16 million private passenger customers, insuring more than 27 million vehicles (auto & cycle).